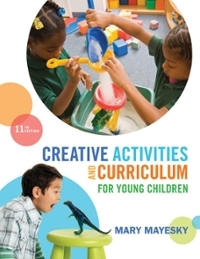 Creative Activities and Curriculum for Young Children 11 Edition CREATIVE ACTIVITIES AND CURRICULUM FOR YOUNG CHILDREN, 11th Edition, is filled with fun, creative, and easy-to implement activities for young children. You'll be encouraged to exercise your own creativity as well as learn how to help young children do the same. Hundreds of activities, up-to-date research, recipes, finger plays, information on how to select children's books, and more make this book an invaluable resource for you and others planning to work creatively with children across the curriculum. This is a book you'll want to use throughout your professional career.